Months ago, a story came out about a groupie. A number of them, actually, but one in particular got a lot of attention, because 1) teenage groupie; 2) teenage groupie makes her sexual debut with David freakin’ Bowie (Blogger’s Note: I hate the term ‘losing one’s virginity for deeply personal reasons and will not be using it); and 3) the legend (because he is one and always will be) is no longer around to explain anything. Is this problematic behaviour? Yes. It was also 40 years ago, participated in by almost all of the big names—you can see how many names were dropped in that article. It was all over the place. It was pervasive. There was an entire subculture around it. And this ‘news’ has been out there for months, if not years. But it gets dragged out now, at the time of the man’s death, when we’re all still reeling from the news. But only a few short days later, the stars began to look different. Literally. From a capture of the sky of the day he went home, a Belgian radio station—Studio Brussels—and MIRA Public Observatory (that place is a big deal, btw) got to work and set up what you see here: Starman. A constellation in honor of David Bowie. An honor usually reserved for gods and legends. …looks like at least one of those has been deemed official. Square Enix, for a limited time, is offering free copies of Omikron: The Nomad Soul—a game that David Bowie had extensive input on (his music, too). In Spring, Carnegie Hall will host two tribute concerts. 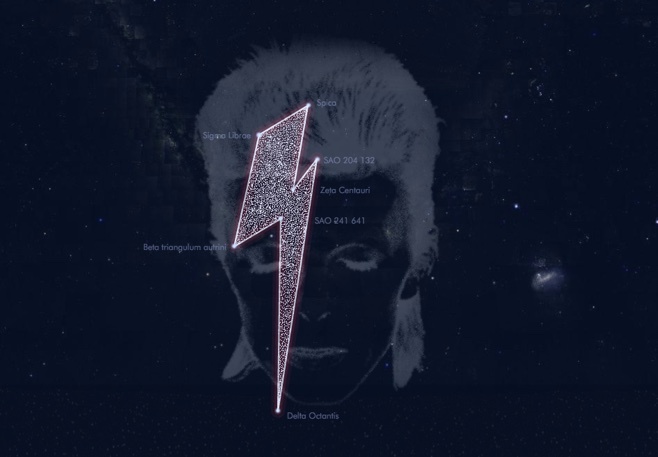 This entry was posted in Current Events, Life…ish, Ramble and tagged david bowie, ramble, rant.